Once it falls behind China, it is unlikely ever to regain the top spot, and by 2030 could also be behind India. By 2030, the bank said, Asian GDP will account for roughly 35% of global GDP, up from 28% last year, and just 20% in 2010. Seven of the world's 10 largest economies will be in Asia in the next decade. The United States of America could lose its position as the world's biggest economy as soon as next year, and once that happens, will likely never regain the top spot as developing Asian economies power ahead. According to research released this week by Standard Chartered Bank, China will most likely become the world's biggest economy by some point in 2020, when measured by a combination of purchasing power parity (PPP) exchange rates and nominal GDP. Using PPP alone,China is already considered the world's largest economy, but on a nominal basis, the US remains in the lead for the time being. Not only will China likely overtake the US in 2020, but by 2030 it will be joined by India, Standard Chartered said in its report, with annual GDP growth set to accelerate from around 6% now to almost 8% in the coming decade. "India will likely be the main mover, with its trend growth accelerating to 7.8% by the 2020s partly due to ongoing reforms, including the introduction of a national goods and services tax (GST) and the Indian Bankruptcy Code (IBC)," Standard Chartered said. 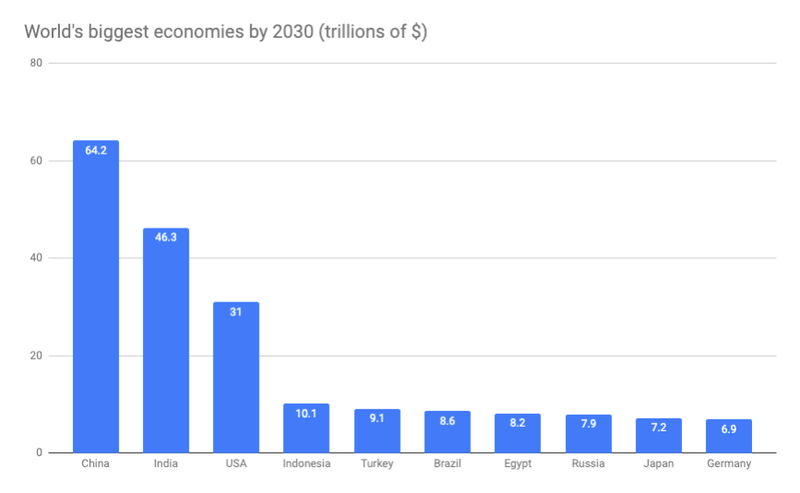 India's rise will also reflect a growing tend of Asia becoming the dominant region of the planet economically speaking as the size of its output starts to match the size of its population. "Our long-term growth forecasts are underpinned by one key principle: countries’ share of world GDP should eventually converge with their share of the world’s population, driven by the convergence of per-capita GDP between advanced and emerging economies," a team of economists from the bank wrote in a note to clients. By 2030, the bank said, Asian GDP will account for roughly 35% of global GDP, up from 28% last year, and just 20% in 2010. This will be equivalent to the output of both the eurozone and the US combined.